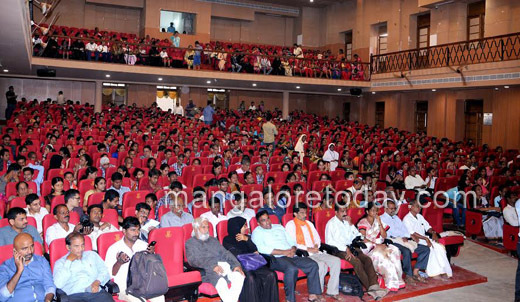 DK DC states "We failed to address endosulfan victims concerns"
Mangaluru, Dec 4, 2015 : Speaking at a programme organised on the occasion of the International Day for the Differently Abled Persons at the Town Hall on Dec 3, Thursday, DK DC Adoor B Ibrahim said a proposal for the construction of a full-fledged and permanent rehabilitation centre in the district has been sent to the State government. He regretted that the demands of specially abled, like separate parking space and ramps or lifts in offices and banks were not being fulfilled. Ramps and lifts should be included in the planning stage of buildings itself. There is a need for an effective implementation of three per cent reservation for specially abled, the officer said. DK DC Ibrahim said that 28,000 people have either become physically or mentally disabled due to Endosulfan in the district. He said the gap between haves and have nots is increasing in the mad race of development. The discrimination against women, dalits, minority,aged, differently abled has not decreased and they are not getting equal platform, which they are eligible to get. This statement of DC Ibrahim comes a few days after the victims staged a dharna in Freedom Park in Bengaluru demanding payment of arrears in stipend and implementation of package similar to that of Kerala government. Endo Virodhi Horata Samiti President Sridhar Gowda said Deputy Commissioner understood concerns of victims. Despite claims over clearing arrears in payment of stipend to 199 victims since June not all have received. “They have received only 1,500 for one month. I have not yet received stipend for five months,” he said. While victims with more than 60 per cent disability are paid Rs. 3,000, those between 25 and 60 per cent receive Rs. 1,500. St Agnes Special School teacher Pushpalatha, Christaraja Navachethana Special School teacher Zeta D’Souza, Roman and Catherine School for Blind student Deekshith, St Mary’s Special School, Kinnigoli, teacher Reshma Jyothi, Saanidhya Special School teacher Veena P N, Lions Special School, Surathkal, Assistant Teacher Meenakshi, Rebecca from Bethani Special School, Mardhala, Sandeepa Special School, Sullia, student Mithun, Chethana Special School, Mangaluru, Assistant Teacher Veena Kulal, Mangalajyothi Integrated School, Vamanjoor, teacher Savitha Kakathkar, Chessire Home of India, Warden Sr Theresita, Andhara Chalana Valana Kendra, Mangaluru, Assistant teacher Sundar C Kotian, Karavali Vikalachethanara Abhivruddhi Sangha President Muhammed Junaid, rural rehabilitation worker, Vittal, Vasanthi B and agriculturist Koragappa were felicitated on the occasion. A number of cultural programmes were presented on the occasion. Demands for consideration : Dakshnina Kannada Zilla Angavikalara Federation submitted a memorandum to the Deputy Commissioner seeking the fulfillment of their demands, such as providing school facilities to specially abled children in rural areas, concession rates in private and express bus fare and airfare for specially abled, increase in monthly pension to Rs 1,500 to Rs 1,200. B inaugurated the programme. Zilla Panchayat Chief Executive Officer P I Srividya, District Women and Child Development Department Deputy Director Sundar Poojary, Lions District Governor Kavita Shastry, District Angavikalara Federation President Dinesh Shetty and Lions Club, Gandhinagar, President Sudhakar Shetty were present. Dakshina Kannada district administration, Women and Child Development Department, Differently Abled and Senior Citizens’ Empowerment Department, District Legal Services Authority and Lions Club, Gandhinagar, had organised the programme. Specially abled children took out a rally from University College, Hampankatta, to the Town Hall. Senior Civil Judge Ganesh B flagged off the rally. We should make our country free from all such deadly diseases. Endsosulfan and Polio is are hazard to our country . There are so many affected by it. But after the vaccination against polio our country is free from Polio. Same way we have to fight against it.